This simple and elegant table and bench set has been one of our most popular items. It assembles using no tools, by means of tapered pegs in through-mortised tennons. The bench can easily support over 600 pounds! 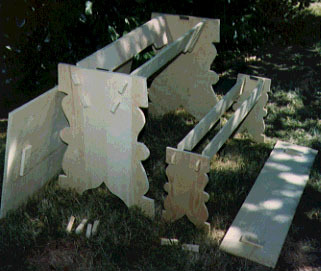 Yet it can be taken apart in seconds, and stacked flat for transport or storage. 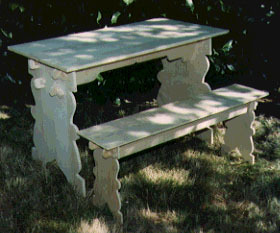 The standard model is a table 2' wide x 4' long, x 30" high, with two 11.5" wide, 4' long x 18" high benches. (Seats four adults, two per side). Other lengths, widths and heights can easily be ordered. 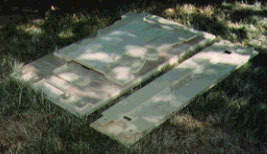 Usually constructed of 3/4" thick cabinet grade plywood and sealed with a polyurethane finish to protect it from the weather. This item can also be custom ordered in solid wood versions, with thicker parts. Other custom options, such as different leg and rail styles, piercework in the legs and rails (to decorate as well as to lighten the weight), or game boards painted on the table top can easily be accommodated. When stacked flat, the table is 3 inches thick. A 4 foot bench, stacked flat, is 2.25 inches thick. You can set a pair of benches side-by-side under the table for a total thickness of a mere 5.25 inches. of our website, or use the text-based links, below.